Back in the mid 1960s, I got a job as an Aircraft Mechanic after serving my time with the US Air Force. The company was a new small start-up company that focused on maintenance and repair of small privately owned aircraft in Ventura, California. The owner of the company was a retired Lufthansa Pilot and his two adult sons, Wolfgang (Bill) and Gunther. The sons were "learning the ropes" of the business and business was brisk and good. One day Bill and Gunther decided to bring all the aircraft batteries into the inventory area for safe keeping. There was little room on the shelves so they decided to put all the batteries on the floor, the concrete floor. When some of the maintenance people saw the batteries on the floor they became alarmed and proceeded to caution Bill and Gunther. They told them that if they left those batteries on the concrete floor overnight they would go completely dead and it would be difficult to re-charge them back beyond a 50% charge if they were lucky. Bill and Gunther were very smart guys, well educated but didn't have an extensive mechanical experience background. When they heard the concerns of a couple of the young American aircraft mechanics, they became amused and countered with "what is this? Is this an American folklore myth or something?" I began to get interested in this story myself since I had a battery in my garage that was on the concrete floor and it coincidentally, went dead on me and was difficult to recharge. Bill and Gunther just smiled at the other guys and with a slight grin on their faces, they secured the inventory store room and began to shut down the hangar for the night. The next morning some of us waited for the store room to open to see, if in fact, those dozen or so aircraft batteries had gone dead overnight. Sure enough, the store room manager tested a few of the batteries randomly and they were indeed, dead batteries. Bill and Gunther were not convinced and commenced to test all of them. Some were very weak and more than half were just plan dead. Many of us had some theories such as "ions creeping" along the exterior case of the battery and down to the negatively charged concrete floor. Later, the store room manager decided to rest all the batteries on a wide plank of 2 x 12 lumber and that seemed to solve the problem of dead aircraft batteries. Over the years I've had several MG batteries in and out of the cars but I never had the nerve to re-test this theory of dead batteries and concrete floors. Call it plain ol' superstition or American folklore, or an Urban Legend but I always will put something under a car battery if I store it on the concrete floor for any length of time. So, is this an urban legend or something to watch out for? The answer is a bit of both. From an article on the subject at http://www.thebatteryterminal.com/TechTalk_Batteries_on_Concrete.htm by Gale Kimbrough and Interstate Batteries. Well, is it true? Will a modern battery be damaged or discharged by letting it sit on concrete? NO! Why then do so many people believe that concrete is a battery enemy? Years ago, batteries could have been electrically discharged by sitting on a concrete floor. My dad, for instance, owned an automotive shop for many years. In fact, I grew up on a creeper. My dad reminded me time after time, "Set that battery on wood! I know batteries discharge on concrete because I've witnessed it!" And he was right at that time. You see, the myth that concrete drains batteries does have some historical basis. Many, many years ago, wooden battery cases encased a glass jar with the battery inside. Any moisture on the floor could cause the wood to swell and possibly fracture the glass, causing it to leak. Later came the introduction of the hard rubber cases, which were somewhat porous and had a high-carbon content. An electrical current could be conducted through this container if the moist concrete floor permitted the current to find an electrical ground. The wise advice of the old days to "keep batteries off concrete" has been passed down to us today, but it no longer applies because of the advanced technology of today's batteries. 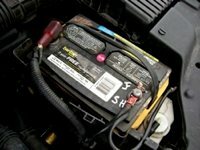 For more than a decade, automotive and commercial battery containers have been made of polypropylene, which is a highly insulative material. In fact, the Interstate Batteries poly material is at least five times more insulative than the old hard rubber. Also, tremendous technological improvements have been made in the seals around the posts and the vent systems, which have virtually eliminated electrolyte seepage and migration. The fact is, all batteries self-discharge whether they're sitting on the shelf or on concrete. This is why we regularly rotate your inventory. As the temperature increases, a battery's self-discharge level also increases. Some lead acid batteries discharge 4% - 8% per month at a temperature of 80°F. The level of self-discharge is also contingent upon the type of lead plate alloy plus the age and cleanliness of the battery. If the battery has a surface layer of acid or grime, which is electrically conductive, it self-discharges more rapidly. This surface layer may actually allow you to measure the DC voltage across the battery's poly case (using a 10 mega-ohm digital voltmeter). For that reason, we recommend that you always keep batteries clean, whether they're in storage or in a vehicle. Comments on "Battery Storage, Fact or Fiction?" Nice article! And now I know!! Very interesting read.. I was a parts manager for twenty years and I heard this a lot. I always stored batteries off the floor in a plastic tray set on wood blocks. But, my reason was this, sometimes batteries leak. In the plastic tray the leak was contained and I could throw in a few handsful of baking soda and neutralize the acid and it didn't mark up the floor. How do I connect a trickle charger to the battery in my bug eye. The positive terminal is the ground and negative is hot. I don't want to fry anything. The trickle charger has a red clip for positive and a black for negative, ...but you know all that. Put the negative clamp on the negative post of the battery and the other on positive and the red LED charging light on the trickle charger will light up as it should and there should be no difference. There simply isn't enough current to "fry" anything with a trickle charger. Make sure you have good battery connections (cleaned) before you charge the battery. This works on Bug Eyed Sprites as well. Even though it's a positive ground, this is ok to do as you commented to do. Ok to leave the battery connected in the car? You're usually only allowed one follow up question but I'll make an exception just this once. (kidding). Yes, this is ok to do. Yes, ok to leave the battery connected. I read it all. My Triumph battery is stored for the winter in our basement. On an old upturned plastic bucket. Didn't want to leave it on the concrete floor. I'm old. Great read. Thanks.Paul M.